One is random, two is a coincidence and three's a trend, right? Or something like that. If there's any truth in that saying, then surely scarf tie sandals are an emerging trend this season. Imagine a colourful scarf wrapped around your ankles instead of at your neck, the prettiness of the fabric and fluttery bow, and, well, you can understand the appeal of this particular shoe style. They're a softer, more feminine alternative to the buckled straps, studded leather, and gladiator styles we've seen in recent years. 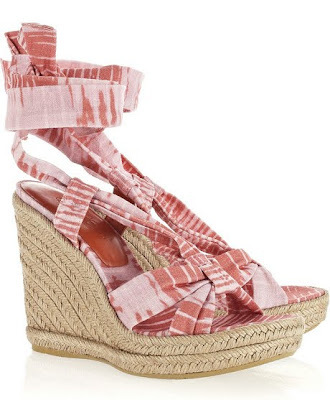 Stuart Weitzman x Theodora and Callum espadrille wedges, $395 on Net-A-Porter. Also available at select Stuart Weitzman boutiques. If designer sandals are beyond your budget, you can always swap the ties on a pair of wrap sandals for inexpensive scarves or thick ribbons. Or you can mimic the DvF pair by wrapping scarves around a pair of high-heeled mules. Are you going to try scarf tie sandals this spring? Scarf tie sandals are probably also way comfier than regular strappy ones which tend to cut into your foot. I so love the Missoni ones, but I'll probably have to attempt a DIY as you suggested. These remind me of the ones by Pierre Hardy for Gap... Beautiful sandals! I would wear them in a heartbeat! I love the Missoni ones but I feel this look would make my legs look really short (they are already on the shorter side). I tried on a pair of Tod's flats with ribbon tied around. Love it. I love the Missoni ones - if only I could afford them. I think I saw scarf tie sandals at Old Navy. I am always hesitant to try these scarf sandals on because I have such skinny ankles that I think it would look weird.